Evgeni Malkin is one of the best hockey players in the world. And while his presence in the hobby is strong, one has to wonder if he's lurking in the shadows. Starring alongside Sidney Crosby, arguably the most popular player in the sport, Malkin doesn't generate as much hobby buzz. 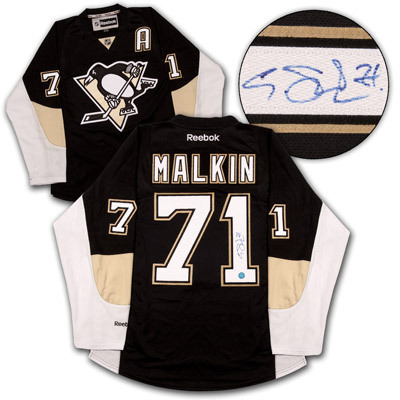 But another run or two at the Stanley Cup could send Evgeni Malkin cards and memorabilia to an even higher level. 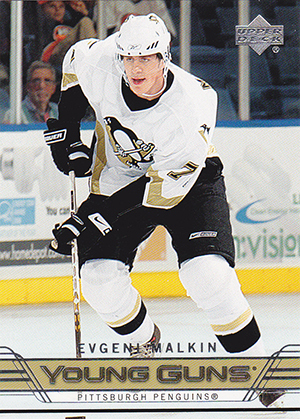 Shop for Evgeni Malkin cards on eBay. The Penguins picked the Russian standout with the second-overall pick in the 2004 draft, behind only Alexander Ovechkin. He debuted with Pittsburgh a couple of years later and made an immediate impact. Malkin notched 85 points during his rookie season, winning the Calder Trophy in the process as the NHL's top first-year player. Malkin won the Conn Smythe Trophy in 2009 as the Penguins won the Stanley Cup. He racked up 36 points in 24 postseason games. The center took home the Hart Memorial Trophy as the NHL's MVP in 2012. It's also worth noting that Malkin has shown a knack for stepping up his game during periods when Sidney Crosby has injured for long periods of time. Malkin hasn't been immune to being hurt, but he's bounced back well every time so far. 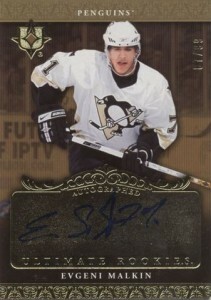 Evgeni Malkin rookie cards are in 2006-07 products. Collectors have more than 20 options, all of which are spread nicely between price levels. Some remain cheap, others extremely expensive and a handful in between. 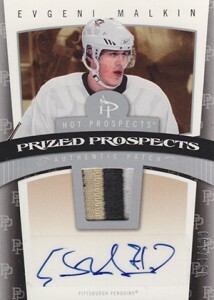 Malkin has five autographed rookie cards, which are considered the top options. When Evgeni Malkin cards are some of the most coveted in the league, he's still not as popular with collectors as Sidney Crosby or Alexander Ovechkin. He's on a level below despite having shown tremendous skill and the ability to lead the Penguins to hockey's ultimate prize. It's a similar situation to how Jaromir Jagr and Mario Lemieux paired up on the team in the 1990s or Wayne Gretzky and Mark Messier a few years before that. 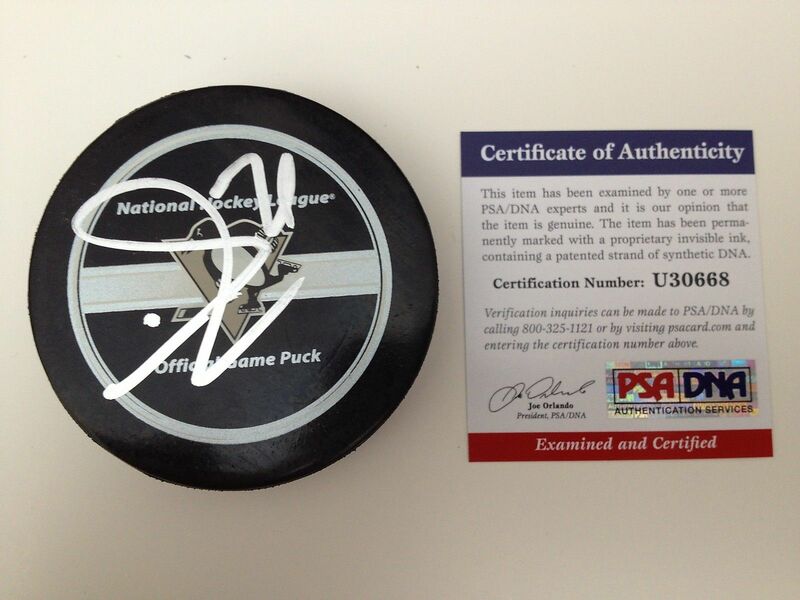 But as time goes on and the Penguins continue to win, Malkin's time in the hobby will come, much like Jagr. Will he ever break free from Crosby's shadow? Probably not completely as long as they're on the same team. But it's still some very special company to be keeping. 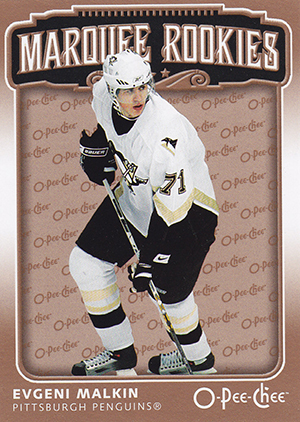 This is easily Malkin's most desirable rookie card. It features a patch, on-card autograph and is serial numbered to just 99 copies. A well-designed card, all of the elements combine to create a card that is not only valuable but aesthetically pleasing as well. 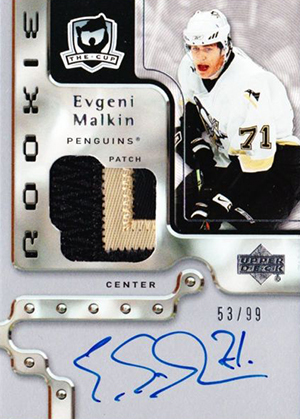 A truly beautiful card that is limited to 99 serial numbered copies, the Ultimate Collection Evgeni Malkin rookie card has an autograph. It is also a less expensive alternative to The Cup. 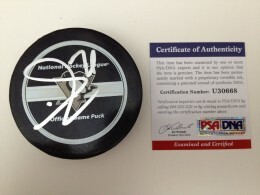 This card is an excellent option for collectors looking for an autographed memorabilia card of Malkin. It doesn't command the price of either of The Cup or Ultimate Collection, but still carries tremendous value. The base version is numbered to 199 while a parallel has just 25 copies. Below you will find an example of what Evgeni Malkin's authentic signature looks like. This can be used as a first point of reference for determining the legitimacy of autograph memorabilia, but is not a substitute for having your items authenticated by a well-respected professional autograph authentication company. Some of the trusted sources within the sports memorabilia market include the following companies: PSA, JSA, and Mounted Memories. 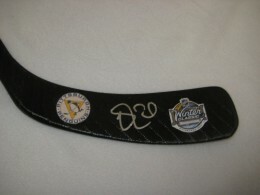 Malkin's signature is very cryptic displaying characters that resemble something closer to hieroglyphics than letters. Each character is fluid and the pen lifts. The first character looks like a backwards question mark, followed by a dot. The next character resembles a letter "S" with a tiny numeral "7" intersecting the bottom swoop. The next character resembles the Greek letter Omega or an upside down letter "U" with a short and long tail. This is followed by something resembling a large number "7" with a Tilde (~) crossing. Next is a straight vertical line with a slight lean to the right followed by a dot.